One of the long running arguments on Islamic Banking in its current state is the level of compliance to the rules of Sharia. There are still many believers out there who are not really believing in Islamic Banking. There are many suspicions in the industry. The main one is that Islamic Banking is a copy of conventional banking with merely a Sharia wrapper around it. This view is admittedly hard to dispel, unfortunately. Especially in a market where the industry is running 2 parallel banking systems ie Islamic Banking and Conventional Banking side by side. Sometimes, there is an additional element ie Islamic Banking Windows where an Islamic Banking operation resides in a conventional banking, leveraging totally on the conventional banking infrastructure. The Middle-East has been able to gain more focus on the development of Islamic Banking. Despite Malaysia being one of the prominent pioneers of the industry, the stability of what we are seeing in the Middle-East has been the focus of ensuring the products they offer are deemed more Sharia compliant. While Malaysia is coming out with innovations to catch up with competition from conventional banks, the Middle-East is looking to products they already have and improving them to ensure Sharia compliance, fully backed by an international Shari’a framework. This is clearly a different approach to the development between the two Islamic Banking industry. In my view, the Middle-East has a clear advantage when in comes to sustainability. The advantage is simply this; the wants of the consumer. The Middle-East consumer simply WANTS Islamic Banking. No question about it. The consumers are split to either want Islamic Banking or does not want Islamic Banking. The trend is shifting away from the view that they are indifferent to any banking structure. There is a growth in preference for Islamic Banking, and this is the main driver for the development of the industry. Malaysia, on the other hand, has a different set of consumers. The Malaysian consumers, whom may be just as pious as their Middle-Eastern brothers, continues to view the Islamic offerings with deep suspicion, which mould the attitudes towards Islamic banking industry. Admittedly, some Islamic Banking contracts have been disputed, tested and contested in a court of law, and in some cases the banks are not able defend these contracts properly. Reputational damage done; and some quarters have taken advantage in making the molehill bigger than it really was. In Malaysia, the consumers only want and expect certain things from their banking product; cost savings features with full benefits, cheap pricing and easy to use. There is strong preference for Islamic Banking products but if there is a better alternative in the conventional banking space, the attitude is “Why not?”. At the end of the day, it all comes down to dollars and sens; “How much does it cost, what savings do I get, how much do I save”? Islamic or non-Islamic? It is all about what money I earn or save which I can use for my family and myself. Maybe economic standing of the consumers do play a part. A product in Malaysia seems to be more about justice, even if it is just a misplaced perception, and therefore it must be cheap. Islamic Banking products in Malaysia have evolved significantly since its inception in the early 80’s. It is now more equitable, competitive and in many cases, has more “justice” elements in its structure. The issues that may arise 10 years ago, in my view, has already been looked at and smoothed out. Bank Negara Malaysia (BNM) has introduced many measure to support this idea of justice. The Ibra guidelines to ensure equitable settlement. Regulated Late Payment Charges to ensure consumer rights are protected. Synchronisation with the conventional banks on Responsible Financing and Product Transparency. Tight regulations of the Fees and Charges that an Islamic bank can charge to consumers. Does anyone know how rigorous the process BNM has imposed to approve fees and charges that an Islamic Bank can charge? 4 levels of approval at BNM, even after the Bank’s internal Sharia Committees have approved those charges. To get approval from the internal committee is already tough; to go to BNM to get the final approval is not something we look forward to. These are good steps, but is it enough? Will the Malaysian consumer take that quantum shift to buy into Islamic banking products? As I mentioned earlier, the main difference between what’s happening in the Middle-East and Malaysia is the consumer preference. In Malaysia, the consumer wants a product that provides justice to them, whether it’s pricing or features or convenience. Islamic or otherwise, it’s the job of Islamic Banks to win them over. Therefore, this difference in the consumers mindset in the Middle-East may eventually be an important factor. Since Middle-East consumers just WANT Islamic banking, the industry there is given the benefit of the doubt for its development. Because of this, the emphasis of the development is more on Sharia compliance rather than just pricing, features and innovation. My limited experience in the Middle-East led me to one important conclusion; consumers want the comfort that when they choose Islamic Banking, the product must assure it meets the Sharia compliance required. By this, it is important to know the people who develop and approve the products. Great weight is placed on the names and reputation of the Sharia scholars themselves. Consumers genuinely want to know who approves the product structure, and want to see the scholars stamp on it. 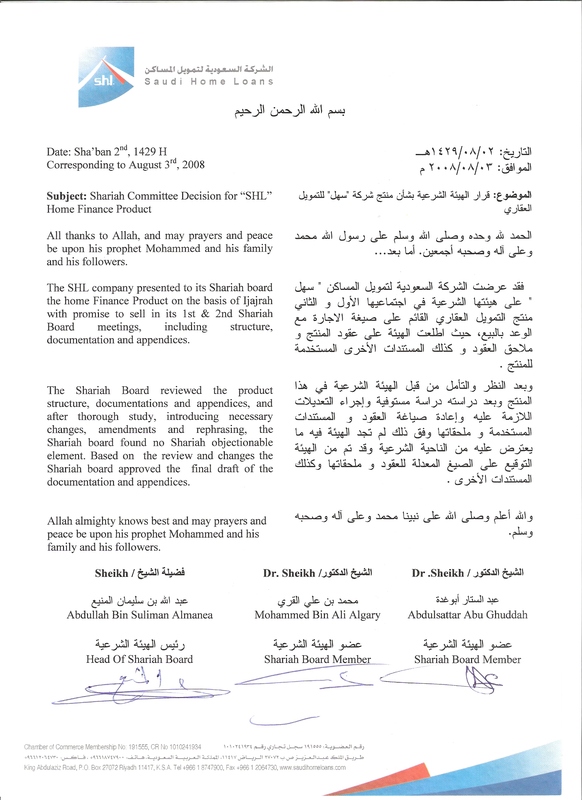 Requests for a copy of the fatwa governing the approval of the product is a norm in the Middle-East. As mentioned, the emphasis is on Sharia compliance, more than merely pricing. There is a huge trust and confidence in the Sharia scholars themselves, in their ability and the quality of decisions made on the products. For that, I do applaud the consumers who chose Islamic Banking for looking beyond pricing. Many times I have been asked to furnish details and profiles of the Sharia scholars who approved the products. The decision to buy the product is more often than not, based on these profiles. The assurance of Sharia compliant banking became more important, even though there are better pricing elsewhere. And I believe that product innovation will have to come naturally once the performance of the Islamic banking industry is in the upswing. Competition and customer feedback drives innovation, but in the first place we need the right customers asking for the right solutions to be banking with us. As pricing and feature becomes the second priority, the Middle-East banks will be well placed to take a step back and assess compliance and therefore build consumer confidence organically. Furthermore, many corporates and government-linked institutions mandates their financial dealings to be Sharia compliant, even making it part of their constitution and governance. This will drive the demand for Sharia compliant banking even more. With a ready market seeking, looking and wanting Islamic products and services, one can foresee a sustainable growth in the industry. I don’t know what can possibly change the consumer mindset for this in Malaysia. Until then, we will always be playing catch up with the conventional banks even when BNM is pushing for a more wholesome Sharia compliant banking system. It could be a painful transition that the Banks will find difficult to stomach when the existing structure seemed to be working well. But without this change, will the industry ever make that quantum leap? It’s catch-22. Someone needs to be bold enough to see it out, bite the bullet and draw that line in the sand; take a chance on Islamic banking with confidence and without so much suspicion. Maybe that is what is needed to make that paradigm shift in consumers. This entry was posted in Bank Negara Malaysia, Islamic Banking, Islamic Banking Contracts, Questions and Answers and tagged Islamic Banking, Malaysia, Middle-East, Sharia Compliant Banking by Amir Alfatakh. Bookmark the permalink. Based on my limited (extremely limited) experience BNM has to look at creating a check and balance system where each and every shariah’s deliberation is subject to scrutiny by a third party. Perhaps one of the thing is to make it compulsory for shariah committee to provide a written report of the ground of their deliberations. In this regard, I think our courts are more Islamic where judges have to provide their written ground of judgement and accessible to lawyers. For a start, the discipline for writing down decisions of new / difficult issues must be practised. A basic “research” template should be developed as a standard outlining the background, matters arising, issues to be resolved, implications, customary practices, the maqasid Sharia, the proposed decision, basis of decision, sources on which the decision is derived from, disclaimers and assumptions. This should be given ample time for consideration, properly discussed and argued, objections recorded (if any) and decisions logged as binding and implementable. And you are right, it should be made available to public, even if it is a summarised decision.